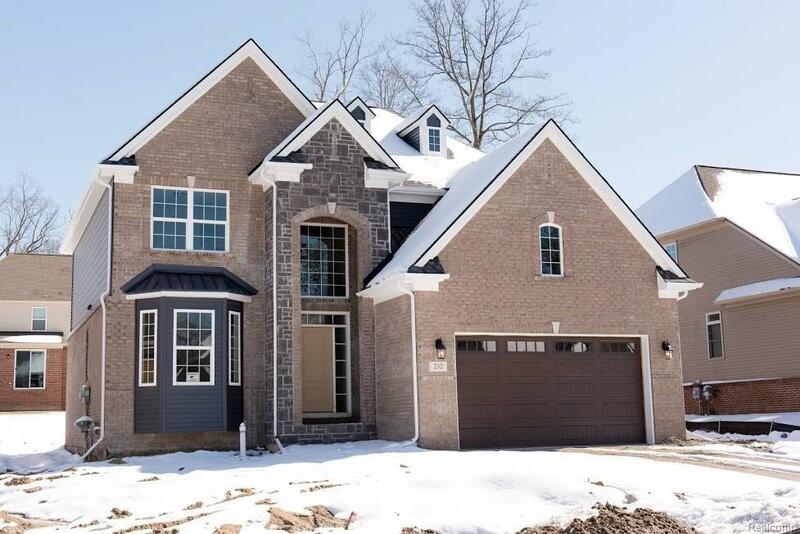 Lot 34 Charleston Park-New Construction. Immediate Occupancy. Beautiful 4 bedroom Colonial with, 2.5 car oversize garage, across from a wooded nature preserve. 9' ceilings and hardwood Floors in foyer, Kitchen, nook and powder room. Kitchen has a 2 ft bump out including nook to give the kitchen a grander feel with 42" maple white cabinets, walk-in pantry, Stainless Steel appliances, Kitchen has a social island with sink and dishwasher with a large window looking out the back of the home. Quartz kitchen counter tops and granite in main and master baths. Stained railings and painted spindles, Fireplace in Family Room. 8ft tall carriage style garage door, Two story foyer, 12 month builder warranty, 10 year basement warranty Tremco waterproofing system. This quiet and peaceful retreat suburban community comes with the conveniences of Suburban living. Close proximity to downtown South Lyon, restaurants and shopping!